Tucked away atop a cliff of serene Nusa Dua, Samabe fulfills the criteria of a romantic haven with its private and tranquil area that most honeymooners seek for. 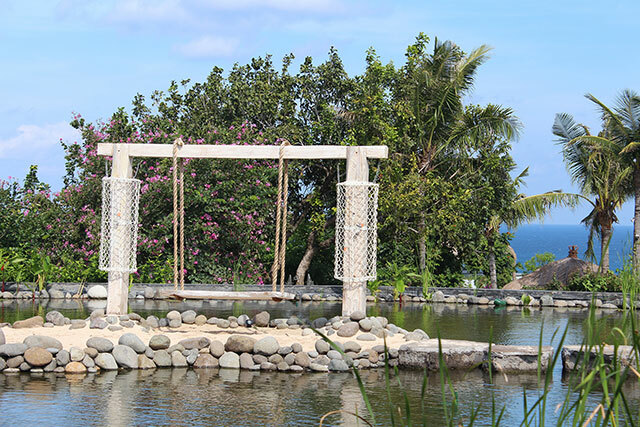 Lately, this resort attempts to put a little sweet touch to its area with a small island named "Lock Your Love", and make it more romantic with a swing for two and wire-netted cement construction for love padlock that will be engraved with couples' initials. The idea of the love padlocks is inspired by Pont des Arts, a bridge in French that crosses over Seine River. The couple locked the padlock with their initials and threw the key to the river as a symbol of an undying bond, and it has made Paris a romantic travel destination. The 'ritual' of putting padlocks and casting the key will be almost the same like the one in Samabe. After the lovers hang their padlock, they can throw the key to the lagoon. "We endeavor to create every corner in Samabe romantic. Through this new "Lock Your Love" Island, I hope Samabe will be captured as a part of our customers' romantic story. ", said Ralf Luthe, the General Manager of Samabe Bali Suites & Villas. The love padlock can be purchased at our reception, and only available for the guests staying at Samabe Bali Suites & Villas.